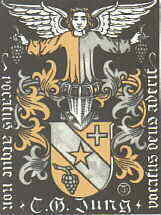 C. G.. Jung's ex libris with the motto that appears over the door of his Kusnacht residence and on his gravestone. Finally... the two gods came upon the ramshackle hut of a poor, elderly couple. The elderly couple's names were Philemon (loving disposition) and Baucis (tender). And although Philemon and Baucis were incredibly poor, they welcomed the two strangers into their home and shared what little they had with the visitors. The next day, Jupiter and Mercury revealed to Philemon and Baucis who they were. Grateful for being welcomed into the elderly couple's home, the gods rewarded the old couple with one wish. Much in character, the humble couple's only wish was to be allowed to stay together until death and also beyond. Jupiter and Mercury granted the couple's wish. Instantly the ramshackle hut was transformed into magnificent temple - where, for the rest of their lives, Philemon and Baucis served as priest and priestess to the gods. When the kindly couple reached the end of their lives, they died at the same time and were transformed into two trees standing side by side. The trees stood so close to one another that their branches were entwined in an eternal embrace. What happened to all the many people who'd refused Jupiter and Mercury shelter? They were then drowned in a great flood and thus repaid for their godlessness. The archetypal motif of the gods visiting earth disguised as poor, unknown visitors is quite common among differing cultures and religions. In the Judeo Christian tradition (for example), the unknown visitors are most often identified as being angels. And the New Testament Book of Hebrews strictly cautions us to be kind to strangers because we may be entertaining angels unaware. Called or not called, the god (the archetype) will be there. "It seems to me to be one of the greatest contributions of Jung and his work that it taught us to keep our door open to the "unknown visitor." He (Jung) also tried to teach us an approach through which we can avoid the wrath of this visitor, which every frivolous, haughty, or greedy host in the folk tales brought down on himself. For it depends only on ourselves whether this coming of the gods becomes a blessed visit or a fell disaster." Called or not called, the god will be there... and the question is: Will you welcome the god or turn the god away? "... and otherwise [the saying is] found in Erasmus's collection of Adagia (XVIth cent.). It is a Delphic oracle though. It says: yes, the god will be on the spot, but in what form and to what purpose? I have put the inscription there to remind my patients and myself: Timor dei initium sapiente ["The fear of the Lord is the beginning of wisdom."] Here another not less important road begins, not the approach to "Christianity" but to God himself and this seems to be the ultimate question." November 19, 1960 letter from Carl Jung - C.G. Jung (1975) Letters: 1951-1961 vol. 2.